Fun illustrated early chapter book for children to explain how viruses enter the body. Anna has been hiding in waiting while inside young Henry’s nose. 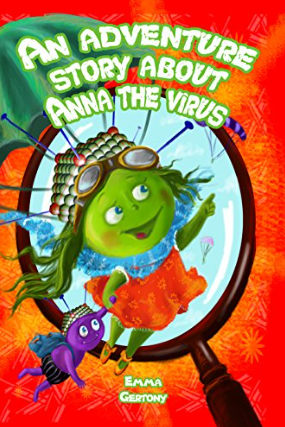 Like her fellow adenoviruses, Anna has a round shape with spikes and is less than 200 nanometers in size. She and thousands of others like her wait for the perfect moment to travel through the air at 100 miles per hour and land on a surface like a park railing. Here they lie in wait for an unsuspecting child. Their leader, Captain Roger, calls out instructions. George places his hand on the railing; when he touches an itchy nose, the viruses seize the opportunity to slide down his larynx, hoping to eventually reach his lungs. In the meantime, Ted, who is positioned in George’s Thymus valiantly calls out to his troops, the white blood cells and mucus glands to fight off the viruses. Those viruses seem to be winning the battle until George’s body defenses of high fever and chills initiate a visit to the doctor, who prescribes medication and a regimen of good hygiene to defeat the invaders. This book is richly and vividly illustrated making it a crossover between a picture and early chapter book. Parents of preschoolers might want to use it to explain what makes a child feel sick. Older children will enjoy the humor and the adventure story. Recommended especially for children ages four through ten. Good choice for libraries, doctor’s waiting rooms, and classrooms.